Newborns Cuvier’s beaked whales are 2.7m long and weigh 275kg. They can grow to 7m long, and reach 3tonnes in weight; females are usually heavier than males. Life span is uncertain, but probably reaches 60 years. 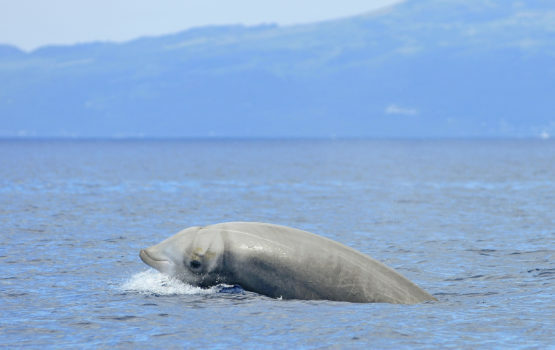 Cuvier’s beaked whales have a robust body. In general, the body is dark grey to rusty-brown, with some countershading. Adult males have a white head, and this lighter colour pattern can expand onto the upper back. In females, this colouration is less pronounced. There tends to be a dark area around the eyes. Adult individuals are heavily scarred, especially males. Their beaks are shorter than other beaked whales. The melon slopes steeply but smoothly onto the shorter thick beak. In mature males, two teeth erupt from the tip of the lower jaw and point somewhat forward. The teeth are visible even if the mouth is closed. The dorsal fin is small, and set about two-thirds of the way back on the body. Based on stomach contents studies, their main prey item is squid, although occasionally they forage on fish as well as crustaceans. 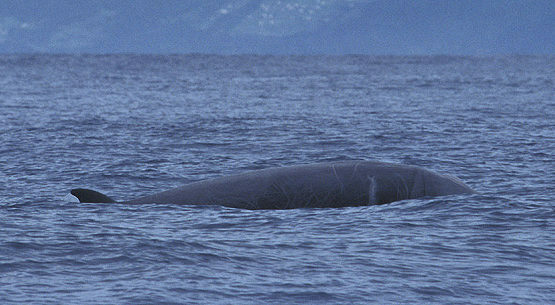 Cuvier’s beaked whales are usually seen alone or in small groups up to 7 individuals. Worldwide, there are more strandings of this species than any other beaked whales. 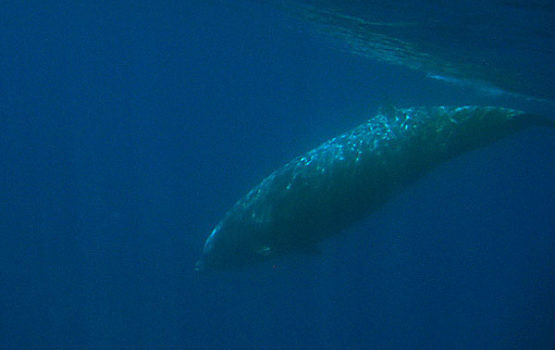 Cuvier’s beaked whales are widely spread from tropical to cool temperate waters. They also occur in the Mediterranean Sea. These whales seem to have very specific habitat requirements – slope waters with steep depth gradients. 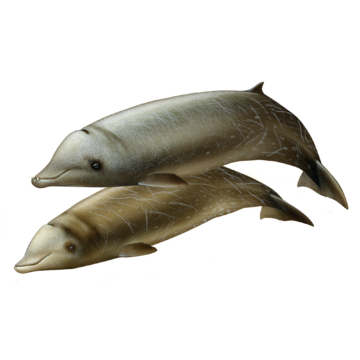 At a distance it may be hard to distinguish them from the other mesoplodon species, however the Cuvier’s beaked whales are usually larger and don’t have a long beak. They could eventually be confused with northern bottlenose whales (Hyperoodon ampullatus) although these whales are larger and with a very different head shape and larger beaks. Espaço Talassa team has been observing this species since 1996. There are usually a few sightings per season (1-7), which can occur between June and October, but are more frequent in the late summer months (August and September), probably coinciding with the peaks of warmer water in the archipelago.